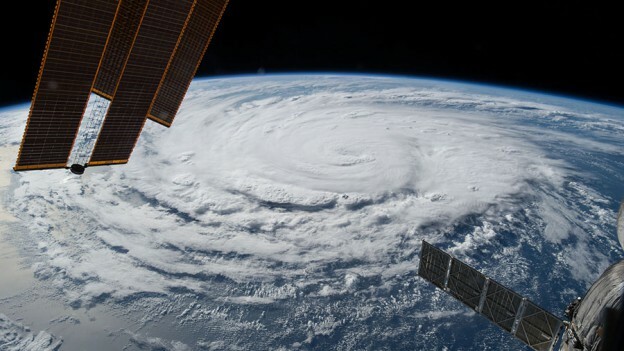 ISS044E078230 (08/30/2015) — Hurricane Jimena was a category 3 storm and was about 1,000 miles east of Hawaii, traveling at a rate of 10 mph when this image was captured by the International Space Station on August 30, 2015. The nine-member International Space Station crew participated in a wide variety of advanced microgravity science throughout the orbital laboratory. 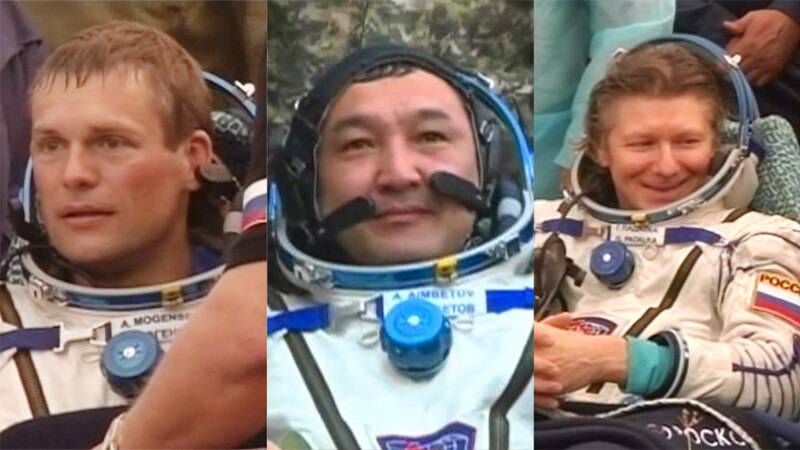 Three of those crew members are also getting ready to return to Earth at the end of the week. NASA astronaut Scott Kelly, who is now the station commander, worked in the Japanese Kibo laboratory to set up gear that will deploy two small satellites outside the lab module next week. Flight Engineer Kjell Lindgren spent the afternoon troubleshooting the humanoid Robonaut 2 which could assist future crews with routine or dangerous tasks. 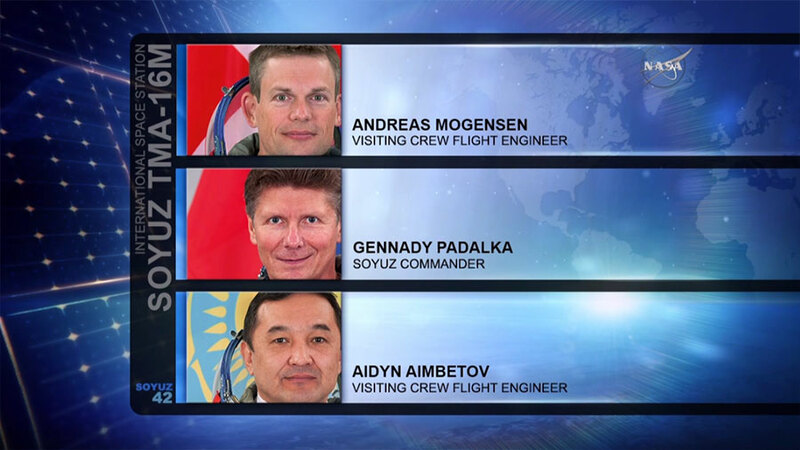 The homebound trio including Gennady Padalka, the world’s most experienced orbital crew member, and first time space visitors Andreas Mogensen and Aidyn Aimbetov are getting ready to leave the space station Friday evening. They will undock in the Soyuz TMA-16M spacecraft Friday at 5:29 p.m. EDT and land in Kazakhstan just three-and-a-half hours later. Padalka continued ongoing Russian science studying plasma physics while Mogensen, from the European Space Agency, worked in the Columbus lab module on exercise gear. 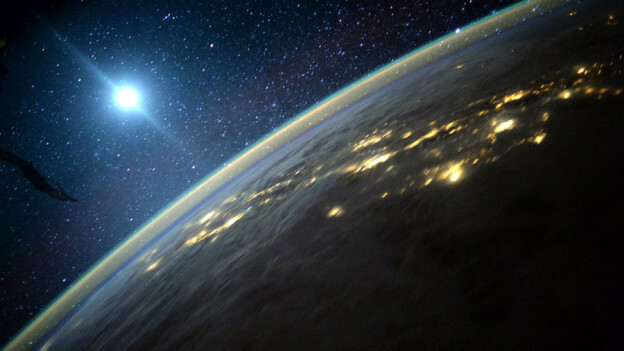 Aimbetov, representing Kazakhstan, participated in various tasks for his space agency, Kazcosmos. Cosmonaut Gennady Padalka handed command of the International Space Station to astronaut Scott Kelly Saturday. 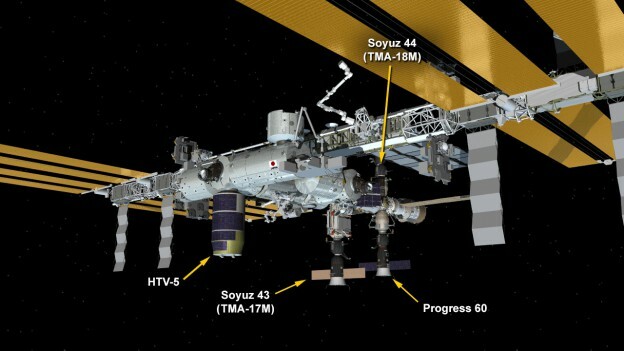 The following day a docked Russian resupply ship fired its engines raising the orbital laboratory’s altitude to prepare for upcoming Soyuz and Progress missions. Visiting crew members Andreas Mogensen and Aidyn Aimbetov joined Padalka for a Soyuz descent drill as they prepare for Friday evening’s landing inside the Soyuz TMA-16M spacecraft. 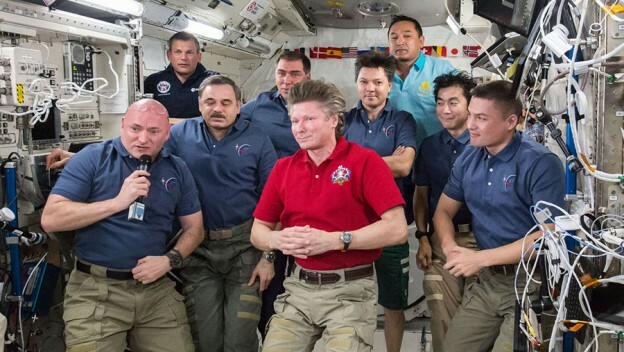 When Padalka lands he will have accumulated 879 days in space over five missions, four on the space station and one on Russia’s Mir, a world record. This is the first mission for Mogensen and Aimbetov. Meanwhile, the international crew of nine has been conducting advanced microgravity science to benefit life on Earth and future crews. NASA astronauts Kelly and Kjell Lindgren tested the humanoid Robonaut. Japanese astronaut Kimiya Yui checked out rodent research gear. New Flight Engineer Sergey Volkov worked with Mogensen on the Muscle Atrophy Research Exercise System. 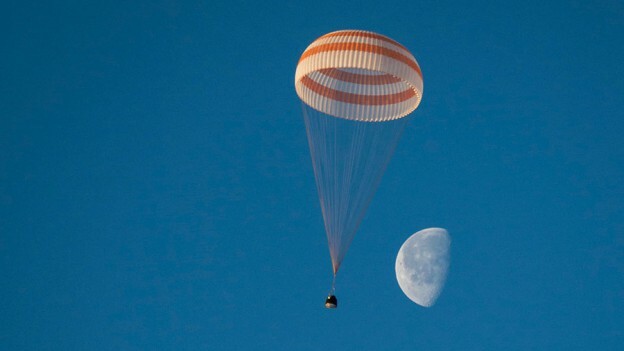 Soyuz crew members Sergey Volkov of Roscosmos, Andreas Mogensen of ESA (European Space Agency) and Aidyn Aimbetov of the Kazakh Space Agency joined their Expedition 44 crewmates when the hatches between the Soyuz TMA-18M spacecraft and the International Space Station officially opened at 6:15 a.m. EDT. 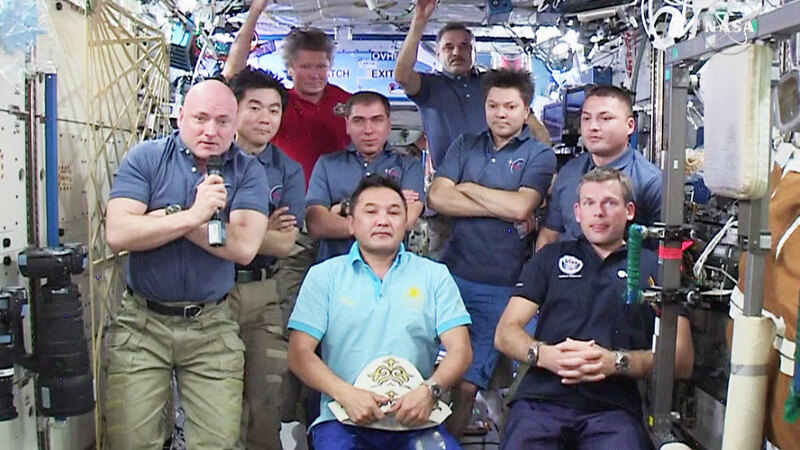 Expedition 44 Commander Gennady Padalka of Roscosmos, as well as Flight Engineers Scott Kelly and Kjell Lindgren of NASA, Flight Engineers Oleg Kononenko and Mikhail Kornienko of Roscosmos, and Kimiya Yui of the Japan Aerospace Exploration Agency (JAXA) welcomed the new crew members aboard their orbital home, marking the first time since 2013 that nine people have been aboard the orbiting laboratory. The crew will support several hundred experiments in biology, biotechnology, physical science and Earth science — research that impacts life on Earth. The trip enables Roscosmos to rotate a crew member and a Soyuz spacecraft. Volkov will remain aboard the station for the next six months, returning in March 2016 with one-year mission crew members Kelly and Kornienko in the Soyuz TMA-18M. Padalka, who launched in March with Kelly and Kornienko in the Soyuz TMA-16M, will return to Earth in that spacecraft on Sept. 11 with Mogensen and Aimbetov, leaving Kelly in command of Expedition 45. 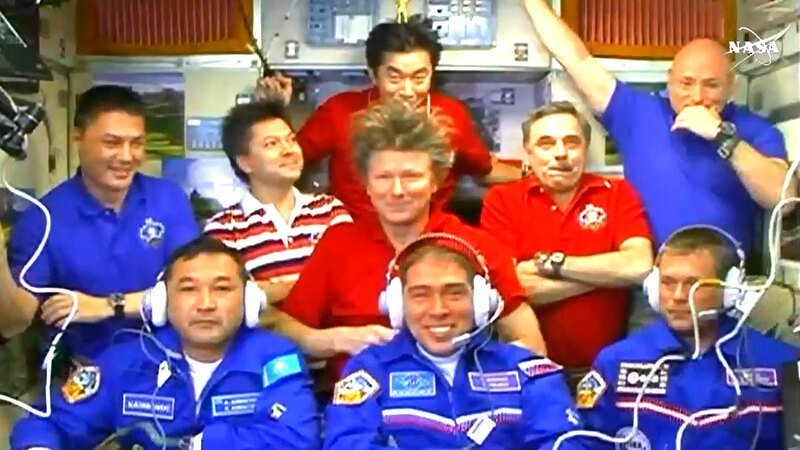 Lindgren, Kononenko and Yui will remain aboard the station until late December. Each Soyuz remains in orbit for about six months. You can follow the crew’s activities in space on social media. 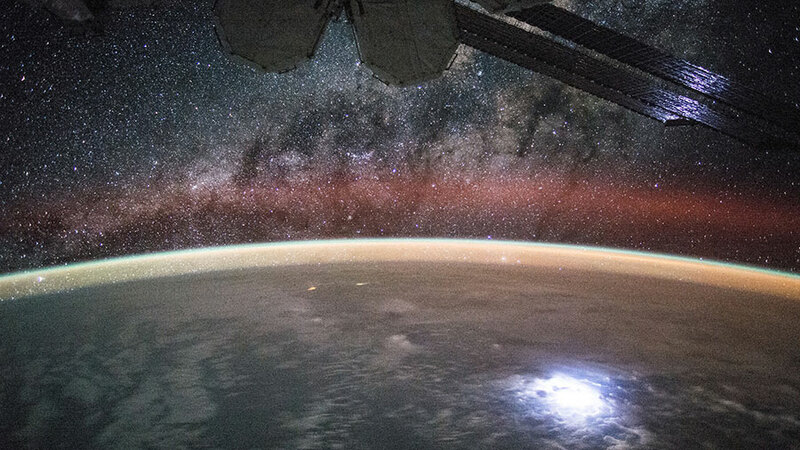 Follow space station activities via Twitter, Facebook, and Instagram. Follow Twitter updates from Kjell Lindgren, Kimiya Yui, Andreas Mogensen, Sergey Volkov, and Scott Kelly, and follow Kelly on Instagram. To join the online conversation about the International Space Station on Twitter, follow the hashtag #ISS. To learn more about all the ways to connect and collaborate with NASA, visit: https://www.nasa.gov/connect.